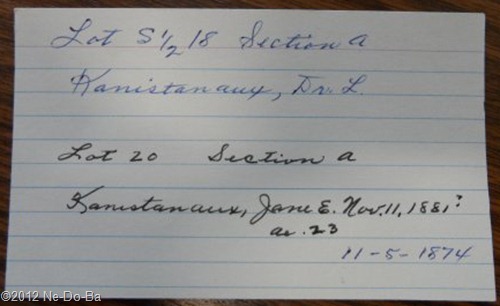 My friend, Randy Blood, has been visiting in New York State and collecting documents for this Kanistanaux family. My next two documents are cemetery cards provided by the local historian (name unknown, age 91). Today I will introduce a new family member. The first thing I need to bring attention to is the nature of these cemetery cards. The cards are not original records, they are obviously modern transcripts and compilations of much older record sets. The information on the cards is therefore subject to the introduction of a number of possible human errors and/or misinterpretations. How do I know this is a modern record? The style of the card and the use of ballpoint pen is the tell. True, index cards have been around for a very long time. Without getting into the details, suffice it to say older ones are distinctly different. This one is nice and clean and white. If this specific card was first used in 1874 it would be yellowed, the blue lines would likely be faded out, and the corners and edges would certainly be dog-eared. Ballpoint pens were not manufactured until 1945 and not in common use for another decade. A fountain pen creates a very distinctive stroke completely unlike the smooth flow of a ballpoint pen, as seen on this card. There is no way to tell from the photos how or when this set of modern index cards was created or what the original source of the information is. Does that original source still exist? If so, it would be so much more useful to see the original records and interpret them for myself. After looking over the two cards Randy took pictures of, I have formed an opinion about the information on these cards, which may or may not be correct. I believe the cards were first created using a ledger book containing a record of cemetery plot purchases. The identification of the lot purchased was placed at the top of the card followed by purchaser’s name. The date of the purchase was placed in the lower right corner. At a different time additional information was added to the cards from one or more additional unknown sources. One source may have been a physical visit to the plot to see what stones existed there. I think this information was placed on the back of the card. Another source may be a burials ledger of some kind, since the cards do contain information for people buried in unmarked graves. Randy actually visited the lots and took a picture of the only headstone there (see my next post). Jane Kanistanaux appears to be buried without a headstone or marker of any kind. So, just who is Jane? She is not with the family in the 1870 Census at Rathbone, where she should appear at about age 12. She is not with the family in the 1875 NY State Census at Stockton or the 1880 Federal Census. In 1875 and 1880 she would have been a teen or young adult, so it is possible she had married or was working away from home. However, at age 12 in 1870, she should probably be with her parents and siblings. Right now I am speculating she married into the family. Besides the above argument, if she were a child of Laton or Marleah I would expect to find her buried in the original family lot that Laton (Dr. L. Kanistanaux) purchased. Instead she is in a nearby lot, which the card suggests may have been purchased by Laton, but it’s not really clear. Of course my question would be – is anyone else buried in 20a with Jane? If so, perhaps they are Jane’s relatives. Young Isaac Henry Kanistanaux is the only candidate I have for Jane’s husband. They are approximately the same age and Henry is the only available male I know about. Jane died in November of 1881 and Henry was single in June of 1880 (census), so if my hunch is correct, it was a very short marriage. Perhaps Jane died in child birth? My marriage theory is reinforced by Henry’s 1910 Census entry showing he was on his 3rd marriage that year. I know of only Christine and Anna Belle. I think it is worth trying to locate Henry’s marriage records in hopes of ruling Jane out as a Kanistanaux by birth. I checked the 1880 Census for Chautauqua Co, looking for a Jane born between 1856 and 1860. There are a number of possibilities, so I think I will wait for a possible marriage record before trying to research this woman further.